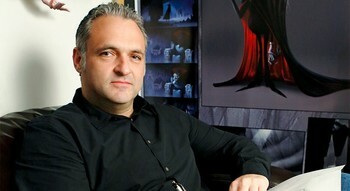 Genndy Tartakovsky (born Gennady Borisovich Tartakovsky, Геннадий Борисович Тартаковский, January 17, 1970) is a Russian-American animation director, producer, and one of the greatest minds to ever come out of classic Cartoon Network. Born in the USSR to Jewish parents, Tartakovsky moved abroad with his family, afraid of anti-semitism, when he was seven years old. First they went to Italy, where he picked up art from their German neighbours' daughter. Upon his arrival in The United States, he got his first exposure to American cartoons and developed a deep love of comic books, Looney Tunes, and Humongous Mecha anime. Genndy would attend the California Institute of the Arts a.k.a. "CalArts" (because he was too late to apply for a business school). There he embraced his future career as an animator and made his first two shorts. His senior thesis film, Changes, was later remade at the pilot for Cartoon Network's first original show, Dexter's Laboratory. While schooling, he formed a strong friendship with Craig McCracken and Rob Renzetti (My Life as a Teenage Robot), which often shows in their cooperation between series. Following his work on another dialogue-heavy show with Thick-Line Animation was one that had neither: Samurai Jack, a hugely ambitious series with a unique, cinematic style, equal parts Akira Kurosawa, Spaghetti Western and anime, widely considered to be both his and Cartoon Network's greatest accomplishments. Plans to end the series with a theatrical feature were put on hold when The Powerpuff Girls Movie flopped and he would spend the next decade pitching it to various studios in between other projects. After creating the Star Wars: Clone Wars mini series, Tartakovsky left Cartoon Network to start his own independent studio, The Orphanage. The timing could not have been worse, as the studio's formation coinciding with both the economic crash in 2008 and the downfall of traditional animation in America. In the end, the studio produced a handful of commercials and a single season of Sym-Bionic Titan for Cartoon Network which, while well-received, was dismissed by Cartoon Network when the creators refused to sign a toy deal and was Cut Short when everyone involved became too involved in other projects to want to make more episodes. Genndy made his feature directorial debut in 2012 at Sony Pictures Animation with Hotel Transylvania (admittedly because he needed work) which was a financial success. After directing its sequel, he was pegged to do an All-CGI Cartoon Popeye feature, returning to his roots, and an original project called Can You Imagine? until both got shelved, instead being put on the third Transylvania movie. In 2016, Genndy finally got the chance to give Samurai Jack a proper conclusion when [adult swim]'s Toonami block agreed to produce a mini-series, with him back in the director's chair, which would wrap up the story for good. The same year, he created Cage, a 4-issue Marvel Comics miniseries starring Luke Cage, which throws-back to the character's blaxploitation roots. Tartakovsky is working on two films in development for SPA; one that is aimed for adults and the other an adventure film. He has been Happily Married to Dawn David since 2000, around the time his notoriety as an animator really took off (he spend part of their honeymoon storyboarding the pilot for Samurai Jack). They currently have two sons. Storyboarding on 2 Stupid Dogs. Also animated the intro. Hotel Transylvania and its two sequels. Animation direction on the Steven Universe pilot. Fixed and Black Knight, two films that are still in development. Action Film, Quiet Drama Scene: Most of his action cartoons are very light on dialogue, to the point that Samurai Jack had several episodes with none at all. Phil La Marr famously joked that playing Jack was "the easiest job ever." Animesque: Most of Tartakovsky's cartoons follow this, mainly because he was inspired by Japanese animation. Art Evolution: He claims that he was "so bad, [he] couldn't draw a circle" when he first learned to draw and that he still had to push himself even when he got into CalArts, falling back on his timing and technical abilities to make up for his draftsmanship. It obviously paid off. Aside Glance: Many of his characters' silent reactions to something odd or stupid taking place often involve this, either directly to the audience or another character. Author Appeal: Giant robots, minimal dialogue, anime influences, and curvy women. Samurai Jack also allowed him to indulge in his love of world music. Cerebus Syndrome: Compare the comedic Dexter's Laboratory to the more serious Samurai Jack or Sym-Bionic Titan. Lighter and Softer: And his first project after Titan was his broadly comic feature-debut, Hotel Transylvania. Creator Backlash: Subverted. While he speaks fondly of working for Sony Pictures Animation, he's also vocal about the homogeneity of CGI, as well as Columbia Pictures' aversion to his pitches for low-budget projects simply because they wouldn't profit as much as big-budget ones. The Movie of Samurai Jack, resulting in the eventual ten-episode revival. And now the Popeye movie. A long-gestating original film at Sony entitled Can You Imagine? has recently been shelved. Getting Crap Past the Radar: Like most show runners from The Renaissance Age of Animation, Tartakovsky is either in love with this or owes it money. Sym-Bionic Titan's Radar entry is pretty much its recap. He tried to bypass the censors entirely with the deliberately profane Dexter's Laboratory episode "Rude Removal." Contrary to popular belief, this was intended to air, but the world was not ready for a family show to depict swearing, censored or otherwise. Samurai Jack managed to get away with excessive violence by making all of Jack's victims monsters or robots before [adult swim] allowed him to kill other humans. Happily Married: He's shown to be very close with his wife Dawn, to the point that he made an animated short about their relationship to play at their wedding. Hartman Hips: As the trope namer used to work for him, it's no surprise that his cartoons are full of some very shapely women . Animated on the Batman: The Animated Series episode "Night Of The Ninja" at the show's studio in Spain. He completed one scene before returning to America to care for his dying mother. One of his first animation jobs was animating Tiny Toon Adventures for StarToons, but only completed two sequences before leaving. Lock and Load Montage: apparently a big fan of these; they can be found quite frequently in all of his cartoons. Ms. Fanservice: Even when they aren't overtly sexual characters, Tartakovsky's cartoons are full of some very attractive women. Playing Against Type: Tartakovsky returned Samurai Jack to television with a 10-episode fifth season, which is more adult-oriented than the last four, although there isn't that much subject matter. He cranks it Up to Eleven with Fixed. A lifelong Star Wars fan, he was eventually invited by George Lucas to create the first Clone Wars mini series. Conan the Barbarian is one of his favorite movies, and was later given the privilege to work with Mako Iwamatsu on his first two shows. And if that weren't enough, Mako later narrated Genndy's life story in the documentary featurette "Gendy's Scrapbook." You don't get a much higher promotion than that. Subverted with his tenure at Hanna-Barbera. While he was a fan of theirs in his youth and continues to borrow from their aesthetic in his later work, he finds their shows too corny for him to enjoy as an adult the same way he did as a child. Rule of Cool: Even in his non-serious related works such as Dexter's Laboratory, he'll often have some form of action scenes in some episodes that either involve or invoke ancient Japanese customs or warriors such as Ninjas or Samurais or Humongous Mechas. Sometimes all at once. While the Samurai Jack movie may never come to be, the [adult swim] mini-series serves as the proper conclusion that the original series' run never got. Cage (2016) was on the back-burner for almost a decade due to Genndy being busy with other projects. Serious Business: The writers for The Powerpuff Girls learned the hard way that he does not tolerate story meetings being used for idle chit chat about anything non-story related, such as discussing video games. Silence Is Golden: Most notably in Samurai Jack. Not as much, but still prominent in Star Wars: Clone Wars and Sym-Bionic Titan. He experiments with this a bit in Dexter's Laboratory. Sliding Scale of Idealism vs. Cynicism: His works are quite heavily on the idealistic end of the scale. Sliding Scale of Seriousness Versus Silliness: Goes both ways. Tartakovsky's work is either broadly comedic with some intense action scenes or dramatic action with a lot of comic relief. In general, he seems to prefer an equal balance of both. Technician vs. Performer: The technician to Craig McCracken's performer: Craig was a stronger draftsman while Genndy handled timing. Thick-Line Animation: Played straight with most of his work, but consciously subverted with Samurai Jack: it has the look, just not the lines. What Could Have Been: Tartakovsky has been involved with multiple projects which either never came to fruition or were canceled just as production got started. He was offered two big directing jobs before Hotel Transylvania. The First was a sequel to The Dark Crystal, which ended up in Development Hell. Then there was the Animated Adaptation of Astro Boy, which was eventually produced by Imagi and bombed so hard that it closed them down. The All-CGI Cartoon Popeye made it all the way up to a publicly-released animation demo before getting shelved when management shifted. This one is especially tragic, as Genndy's animation instructor was a former Fleischer Bros. animator, and the film was seen as his way of returning to his roots, although the serendipity was it let him do the Samurai Jack revival. Before his studio fell apart, they were developing a movie about vikings (before How to Train Your Dragon no less). They were even invited to create a silent film about dinosaurs, which eventually became Walking with Dinosaurs, as Illumination Entertainment's first feature. He pitched several ideas for low-budget features to Columbia Pictures in the hopes that he'd have a better chance of being entrusted with eight figures rather than nine for personal ideas. The studio, however, told him that even if a low-budget film made a profit, it wouldn't make as much as a big-budget film. Widget Series: But as Sym-Bionic Titan proved, this has never looked so cool. The Workaholic: Downplayed. While he eventually did have a family which he makes time for, he makes no secret that he's first and foremost married to his career. He admits that he never saw a completed episode of Dexter's Laboratory until it was on the air, simply because he was too busy making the next episodes, and had next to no social life when it was running. He had to set time aside during his honeymoon to storyboard the pilot for Jack and later spent his date night with his wife doing a Q&A livestream.